To get started with CONNECT, users log into a website and download a small program onto a local computer. All that is needed is a TCP/IP connection, standard Internet protocol. Some companies buy overlapping cell phone ser- vice in order to connect as often as possible, but the pro- gram is designed to work without a connection to shore and will save the data for when a connection is available. Ideally, the software syncs every ? ve minutes. It is agnostic about what type of computer or tablet is used. There is no minimum level of connectivity and the data can move as fast as the connection allows. There are no SATCOM partners. The software is built to be ? exible enough to ac- commodate third party applications, so that all systems can talk to each other. Bill Reid, VP of Product for Helm, says that customer data is secure, even when using the web. All messages are coded and both Helm and host Amazon Web Services are vigilant about keeping the data secure. 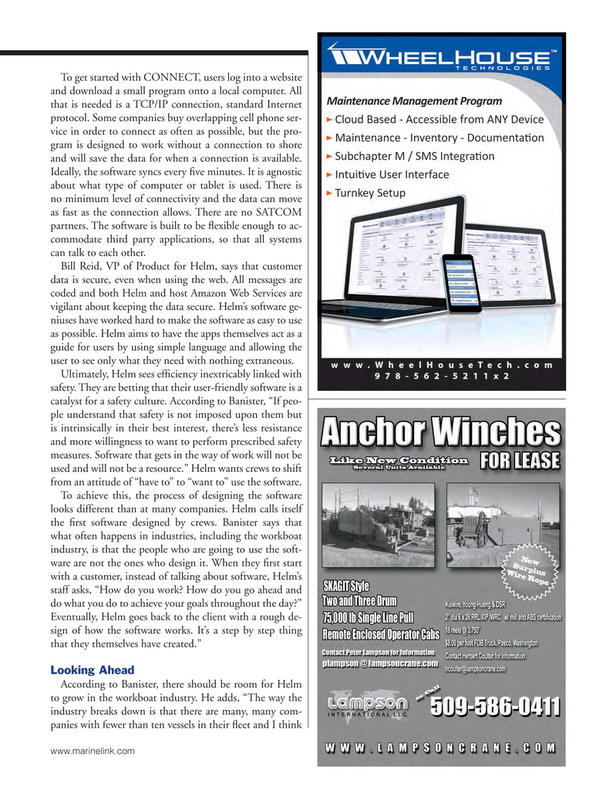 Helm’s software ge- niuses have worked hard to make the software as easy to use as possible. Helm aims to have the apps themselves act as a guide for users by using simple language and allowing the user to see only what they need with nothing extraneous. Ultimately, Helm sees ef? ciency inextricably linked with safety. They are betting that their user-friendly software is a catalyst for a safety culture. According to Banister, “If peo- ple understand that safety is not imposed upon them but is intrinsically in their best interest, there’s less resistance and more willingness to want to perform prescribed safety measures. Software that gets in the way of work will not be used and will not be a resource.” Helm wants crews to shift from an attitude of “have to” to “want to” use the software.